*Links to books mentioned below are to my Amazon affiliate page! 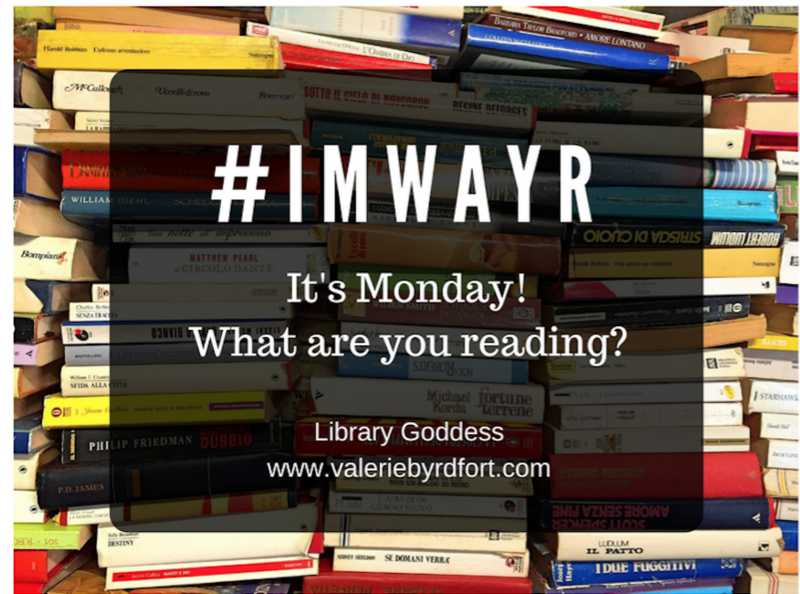 I use any money I make with these links to purchase books for my weekly giveaway! Listening to: Finished The Book of Essie by Weir. I was correct last week! I really just wanted to listen to this book all the time, until I was finished. Compelling story. Today, I am going to start Puddin’ by Julie Murphy. This is a companion to Dumpin’, which I loved. On my nightstand: Finished To Siri With Love by Newman AND finally started (and finished) The Creativity Project edited by Colby Sharp. Awesome book with a clever premise. An article by Panos Mourdoukoutas, posted on Forbes, has caused quite an uproar in the library community. Mourdoukoutas is Professor and Chair of the Department of Economics at LIU Post in New York and he also teaches at Columbia University. After reading the article, his profession baffles me. Why? Keep reading. I’m going to take his points and just drop a little knowledge (which I am not the first to do – I am LOVING everyone on Twitter and on social media, in general, who are sharing the ways he is mistaken). I’ve seen on my feed that Amazon was opening physical bookstores. I think that’s great. I live in an area that doesn’t really have a bookstore, local or otherwise (I have to drive about 40 minutes to get to the closest one), so if Amazon were to open a bookstore near me – I’d be excited about it. Also, I spend A LOT OF MONEY ON THINGS FROM AMAZON. Books, toilet paper, toys, clothes – everything and anything comes from Amazon to my house and I love them for it. So, I am in no way against bookstores or Amazon. I love them both. Mourdoukoutas’ take is that if Amazon opens a location in every local community, communities could then shut down their public libraries and save all the money! His way of thinking is that the amount of taxes we pay that currently go to libraries, would then go back into our pocket?! YES, taxpayer money goes to funding libraries (this is not the only way libraries receive funds, but this is the bread and butter and without those taxes, libraries essentially close). However, does he really believe our government would take that money and give it back to us?!? Let’s pretend this crazy thing happened and we stopped having libraries and just purchased all of our reading from Amazon storefronts – THE GOVERNMENT WOULD USE THAT MONEY FOR SOMETHING ELSE!!! He goes on to explain that no one needs libraries, because Amazon will give us the books, magazines, and digital media we want. He is missing the fact that not everyone can PURCHASE the materials they are interested in reading or viewing. There are families with 0 disposable income. Families who depend on the library for any and all entertainment needs. Libraries are critical to early literacy. He needs to actually visit his local public library soon. Maybe he doesn’t realize the materials available to him ARE FREE?!? He also states that libraries are used for community events, and so what?! Go somewhere else, he says. The problem here is that he obviously has never planned or hosted an event. If you do it somewhere else, you often HAVE TO PAY. Again, why pay for a meeting space or a performance space when I can use my library FOR FREE?!? And, going back to those families with 0 disposable income…an event that takes place somewhere else would most often come with some sort of ticket price attached. Not everyone can pay to take their entire family to an event. The biggest point he is missing from an economic viewpoint – is that libraries help communities MAKE MONEY AND THRIVE. Public libraries are a place for folks who do not have computers or internet access at home to go and fill out job applications, to send out resumes, to GET JOBS. Public libraries offer resume assistance and career fairs and have books about getting the job you want. They help small business owners with their companies. All of this brings money into local communities. How is he missing this?!?! Here is a link to a study done in South Carolina proving the economic impact libraries have in South Carolina – it is an older study, but I am certain the facts remain the same and I am certain it is not special or unique to South Carolina. I hope he is taking all of these links and information that library supporters are sharing with him to heart and that he revisits his views on the economy of libraries. I also hope he’s headed out to his public library for a library card today! Listening to: Finished In the Country We Love: My Family Divided by Guerrero. This is an important story about the kids left behind when parents are deported. Guerrero tells her personal story of being left behind has a young teen. The audiobook was a little much sometimes (sort of like listening to a teenager recording herself doing voices and play acting), but the story itself outweighs any sort of annoyance happening in the actual reading of it. Great one for teens and young adults (or anyone, really) who needs to learn more about this issue so that they can express their feelings with their vote. Guerrero also shares resources and places to go for more information. Now I’m listening to The Book of Essie by Weir. Just started it and I can tell I am not going to want to get out of my car – I’m going to want to stay just to listen. On my nightstand: Almost finished with To Siri With Love by Newman. It is taking me FOREVER, but when you are the before bed book, maybe a page a day gets read? 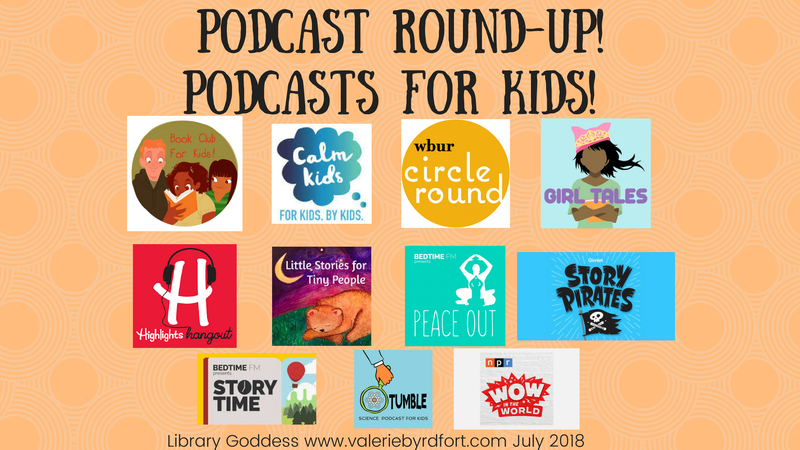 Podcast Round-Up #1 – Podcasts for Kids! I have been an off and on again fan of podcasts for a long time. When I was a practicing school librarian, I had a podcast with my students where we would highlight news going on around the school. I dabbled a few times in creating my own book related podcasts, but that never really turned into a habit. What I do love is LISTENING to podcasts and there are many excellent ones out there for parents, teachers, and librarians on all topics. But, did you know that there are also many fun ones specifically for kids…many of them BY kids!? I have a toddler and I have decided that I can listen to “kiddie music” only so much. Even though we still have lots of dance parties at home – I’ve started expanding our car tunes to podcasts and I am so happy for the change. PS – podcasts are not only great for little kids, but for older kids too. Here is a great article about why kids love podcasts (and why they are great for their brains) from the New York Times (October 3, 2017). I want to share some of the awesome podcasts I’ve been exploring lately. Check out this round-up of some of my favorite podcasts for kids! And, scroll down for a list of a few resources to help you find even MORE podcasts for kids…once I started looking for some, I found a TREASURE trove of them! Book Club for Kids – This is an awesome one for kids who are in grades 3 – 6. Basically, kids read a book and then discuss it. There is a dramatic reading from the book, which will encourage kids to check out and read whatever book is being discussed, if they have not already. I would have LOVED to use this podcast with my students for modeling how to talk about books AND it is even interactive – kids can “call in” to talk about books they are reading! There is also a page on the website with QR codes to each show for you (teachers and librarians) to put on the books discussed. In love! Calm Kids Podcast – The description of this podcast makes my heart melt, “When Charlotte, 7, suffered bouts of anxiety and could not fall asleep, her big sister, Lucie, 11, decided to make up relaxing stories to calm her down and eventually doze off. The two sisters decided to record some of these stories, to help other kids struggling to fall asleep.” There are age recommendations in the descriptions of each show, but I think anyone between the ages of 3 – 10 will be relaxed by listening to this podcast anytime, but especially before resting. Circle Round – I love fairy tales and folktales, so I love this podcast. An aside: you will find that a lot of podcasts for kids that are essentially stories read aloud, are fairytales, folktales, and original tales – reason being, you cannot just read a book from a popular author on your podcast and think everyone will be okay with it – you have to take copyright into consideration and fairytales and folktales are in the public domain. This podcast was created for ages 4 – 10, the stories are short and interesting. The toddler and I have been listening in the car and while I make dinner at night. The website includes coloring pages that go along with each tale. In a classroom, I could see this podcast being used with lessons about folktales and fairy tales – after listening, you could encourage your students to write and illustrate their own tales! Girl Tales – Another one that is retelling popular folktales and fairytales. What I like about Girl Tales is that it offers, “a feminist twist on classic fairytales, fables, and myths.” And, the stories are written by women and trans* playwrights! Highlights Hangout – This one is BRAND NEW! Brought to you by the Highlights Magazine folks. It’s silly and kooky, just what you’d expect. Elementary age kids will love it. Basically, a silly variety show on the “radio” for kids. Little Stories for Tiny People – LOVE the host’s voice. This podcast is original stories, geared towards toddlers and young kids, written by the podcast creator (and host), Rhea Pechter. Great for car rides or bedtime or anytime! Peace Out Podcast – Guided breathing exercises and a bedtime story! The narrators voice is SO CALMING. I might start listening to this before I go to bed each night. Story Pirates – LOVE this one! Kids send in stories they write and professional actors act out the stories. Another great one to use in the classroom! Story Time – Original stories that are less than 20 minutes long. Each show description suggests an age range that will enjoy the story. You could have this one loaded on to classroom devices for students to listen to during independent reading time or during something like indoor recess. Tumble – Great for parents and kids! Science podcast! Scientists answer questions sent in by kids. Teachers! They even Skype with classes. Scroll down on the website for a link to the sign up form! Wow in the World – A great STEM – related podcast that is all about science, technology, and innovation. Fans of XM Radio will recognize Mindy Thomas from Kids Place LIVE. This one is great for all ages! Places to find awesome podcasts for kids! As mentioned above, once I started looking for podcasts for kids, I found SO MANY! Here are a few resources you can use to help you find a few YOU love. The podcasts above stood out for me, but there are so many other great ones to listen to! Find your favorites! 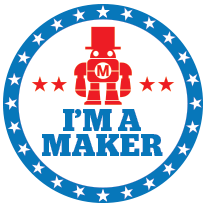 Best Robot Ever – A slew of awesome podcasts produced by Gen-Z Media. Common Sense Media – A great website for parents that will help you make decisions on books, movies, and digital media – like podcasts! Kids Listen – Many of the podcasts listed above are part of the Kids Listen community. Do you listen to podcasts with your kids? Which ones do you love? PS – Next up! Podcast Round-Up #2 – Podcasts for Librarians! Listening to: Finished Bad Feminist by Gay. Planning to read Hunger soon (it’s been sitting on my nightstand forever)! Also listened to Word by Word by Anne Lamott. It was a recording of a speech she gave at a writer’s workshop many years ago. I love Lamott SO MUCH. I want to read some of her fiction next – I have only ever read the non-fiction, but after hearing her talk about how she writes…I’m going to check it out! I am currently listening to In the Country We Love: My Family Divided by Guerrero. Very relevant right now. Aside: I did not even realize who this person was until looking it up on Amazon just now! One of the main characters in Orange is the New Black. I think sometimes I live in a little toddler bubble. On my nightstand: Still reading (and very much enjoying) To Siri With Love by Newman. It is taking me so long, because I fall asleep basically after my head hits the pillow! Reading with the toddler: She is loving Golden Books! She calls them the books with the glitter 🙂 We have a couple of classics, but then my husband found and purchased all of the Star Wars Golden Books awhile back. So, I’ve been reading those. Not the BEST literature, but if she wants me to read them, sure…why not? Took last week off (not of reading, but of posting)! My family had some sort of summer crud, but we are MOSTLY back to normal now! Finally! Listening to: Finished Providence by Kepnes. I LOVE LOVE LOVE this author. This book was great. I already want more! After Providence, I finally read Amal Unbound by Saeed. I let this one sit in my “to read” pile for too long! Excellent story of how one person can make a difference. Now, I’m listening to Bad Feminist by Gay. Another one that I really let sit in my “to read” pile for too long. LOVE her work! On my nightstand: Still reading (and very much enjoying) To Siri With Love by Newman. Took a break to read the graphic novel version of Speak by Anderson. So powerful! A must read (and then discuss) for teens – boys and girls. Reading with the toddler: We are reading Mix It Up by Tulle again and again this week. We read an assortment of awesome picture books and got our huge stack from the library read and returned while everyone was sick…silver lining! Now, I only have SEVEN things checked out and FIVE of them are at the door to be returned! Yikes! Time to get some holds on! Listening to: Finished The Party by Harding. Enjoyed it…lots of teen and family drama. Now listening to Providence by Kepnes. I LOVE LOVE LOVE this author. If you like Stephen King or thrillers, in general…check her out. On my nightstand: Reading (and very much enjoying) To Siri With Love by Newman. Reading with the toddler: She’s back to the blocks books by Franceschelli. We have them all from the library right now, so she’s reading them again and again!